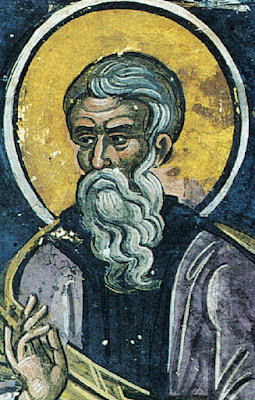 Saint Theodore (Apr. 22) was born in Sykeon, a village in Galatia. The public highway of the imperial post ran through this village, and on the road stood an inn kept by a very beautiful girl, Maria, and her mother, Elpidia, and a sister Despoinia. And these women lived in the inn and followed the profession of courtesans. Theodore was the son of Maria and Kosmas, who had become popular in the Hippodrome in the corps of those who performed acrobatic feats on camels, was appointed to carry out the Emperor's orders. When he was about twelve years old an epidemic of bubonic plague fell upon the village and it attacked him along with the others so that he came near to dying. They took him to the shrine of Saint John the Baptist near the village and laid him at the entrance to the sanctuary, and he recovered and returned home. He used to frequent a shrine dedicated to the martyr Saint George, located up the rocky hill which lay near the village. At the age of fourteen, he went there to live. Even at such a young age, Theodore was granted the gift of healing. The boy had made very good progress in learning to read, when one day he went into the church of the holy martyr, Gemellus, which was near his home and spent the night there. And he saw himself as though he were in the presence of a king surrounded by a strong bodyguard and a woman clad in purple at his side, and he heard the king say, 'Fight the good fight, Theodore, that you may receive full pay in the heavenly army, and on earth I will give you glory and honor in the sight of men.' When he had heard this voice, he awoke. He was twelve years old when his heart was stirred by the message given to him by the King, Christ, in this vision, and in his zeal to follow the path leading to those better things which pertain to salvation he began to shut himself up in one of the cellars of his home from Epiphany to Palm Sunday, and during two weeks in Lent, the first and the middle one, he spoke to no one at all but offered prayers to God alone, and practiced abstinence as he had done before. Once he heard tell of a certain place called Arkea eight miles away that it was impossible for anyone to go near it, especially at the midday hour, because it was rumored that Artemis, as men called her, dwelt there with many demons and did people harm even unto death. As he was astonished at such a report he used to set off at a run for that place during the days of July and August, after he had recited the psalms set for the third hour, and would spend the whole afternoon there in the places supposed to belong to Artemis. And as no evil manifestation showed itself to him owing to Christ's protection, he returned to the chapel [of Saint George]. In this chapel Theodore dug and made for himself a dark cave underground beneath the step of the altar. On the night of the Feast of the Epiphany when some of the clergy and laity had gathered round him he went down with them from the chapel to the ford of the river, and he alone entered into the water and stood there until all the reading from the prophets, apostles and Gospels was over as well as the rest of the liturgy; so that at the end of the service he could only with difficulty pull up his feet all covered with mud and icicles frozen on to them, and thus he re­entered the oratory with psalm ­singing. And when the day had dawned, he celebrated the feast and then retired to his underground pit where he lived in silence until Palm Sunday, so that all who saw and heard this raised their hands to heaven and said, 'We thank thee, O Father, Lord of heaven and earth, that thou didst hide these things from the wise and understanding, and didst reveal them unto this babe; Yea, Father, for so it was well­-pleasing in Thy sight' [Matt. 11:25]. Now his grandmother, Elpidia, truly sympathized with him and loved him more than her two daughters; and she came up to the chapel and stayed with him all the time of his silence and ministered to him and gave him a little nourishment of fruit or some vegetable salad, but this only on Saturdays and Sundays, for the other days he touched nothing at all; and this abstinence he practiced until Palm Sunday. When Theodosius, at that time bishop of the town of Anastasioupolis, heard these things about Theodore, he rejoiced about him and spoke highly of him to all men, saying that it was through the stirring of God's spirit that he accomplished such things.